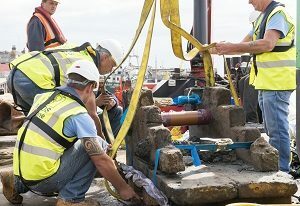 MSDS Marine, Cotswold Archaeology and local divers have worked together to raise a 350 year old gun carriage from the wreck of the London in the Thames Estuary. MSDS Marine were the diving contractor for the project and supplied a specialist team of divers. The divers had to contend with poor in-water conditions including zero visibility, short periods of slack water and strong currents. More information about the project can be found on twitter using #LondonWreck1665. The project received huge media coverage and an article in the Guardian can be viewed here. Photo by Lucy Millson-Watkins, Historic England.